Landing site of Luna 5, Ranger 7, Surveyor 3, and Apollo 12. Geologic Map of the Riphaeus Mountains Region of the Moon by R. E. Eggleton. 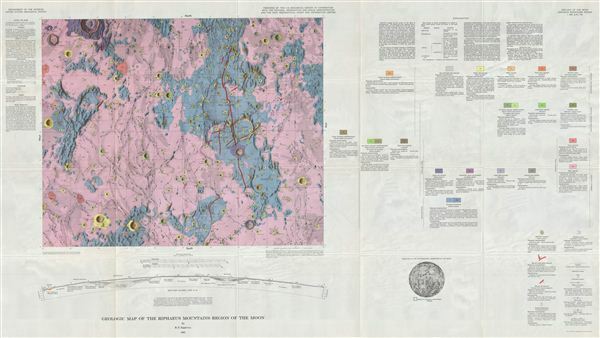 A full color Geologic Map of the Riphaeus Mountains Region of the Moon by the U.S. Geological Survey, as fascinating for its sectional view as for its map. The Riphaeus Mountains, aka Montes Riphaeus, lie along the Mare Cognitum, or 'sea that is known,' (so named for the number of space probes that had landed there -- Luna 5, Ranger 7, Surveyor 3, Apollo 12). This Mare lies on the Oceanus Procellarum, or 'Ocean of Storms.' It includes a number of slender ridge lines with valleys flooded by intruding flows of lava. This lunar mountain range was named after the Riphean Mountains, described by authors of classical antiquity (Aristotle, Hippocrates, and Ptolemy, among others) as snow covered, but whose location seemed to vary from author to author. They may have been the Alps or the Urals. As humans wouldn't land on the moon until 1969, how were we able to map its geology? The map's extraordinarily detailed metadata explains that the cartographers used photos, and observations from optical and radio telescopes, with relief created by measuring shadows, combined with an assumed sun angle and an assumed base elevation. The geology was arrived at from observing differences in, and layering of, topographical forms, and in varying albedo (amount of reflected sunlight), both of which indicate different underlying materials formed under different processes. Goals of this work included the identification of suitable moon landing locations, and sources of oxygen for possible in establishing a more permanent lunar base. The map's sectional view (from the side) is one of the most detailed of the entire series, and provides a Rosetta stone for understanding these maps and how they were made. The map also contains detailed ‘metadata' explaining the mapmaking methodologies and symbols employed, and an index map showing the area's location on the Moon. Created in 1965 by R.e. eggleton and published as plate I-458 in the United States Geological Survey's Geological Atlas of the Moon.